Negulesco, writing in his autobiography Things I Did …and Things I Think I Did, gives credit to John Huston for steering him to the source material for his debut feature, The Mask of Dimitrios (1944). Three Strangers was a second gift from Huston, this one a screenplay that Huston originally wrote for himself as a kind of follow-up to The Maltese Falcon but handed off to Negulesco while he pursued another project. “Three Strangers” turns on another kind of exotic treasure, this one the legend of a Chinese goddess of fortune and destiny who will make a wish come true, and a partnership that dissolves in a spiral of greed, corruption, and desperation. Sidney Greenstreet and Peter Lorre are the two strangers that Geraldine Fitzgerald (never more beautiful, or more dangerously obsessive) pulls off the street at random to follow through on her midnight ritual. The prize: a sweepstake ticket on a horse derby that all three buy a share in and vow to let ride through the end, splitting any fortune it delivers equally. The premise isn’t as complicated as it sounds and Negulesco lets the potential of the characters, and their different responses to the ritual and the agreement (Fitzgerald is a true believer, Greenstreet a dubious but amused participant, and Lorre an amiable drunk happy to just go along with it all), carry the opening scenes in a fascinating play of chance, fate, and superstition in the face of human reason. From there, their stories diverge, each participant caught up in their own dynamic of suspicion and self-destruction that spirals right back to the pact and a conclusion that is, in retrospect, classically Hustonian. Negulesco gives the film a shadowy grace and directs all three actors to marvelously vivid performances. Lorre in particularly has rarely been better than as the sleepy-eyed small-timer, as kindly and innocent as you’ll find in the underworld culture of American crime moves. It’s a superb film that has rarely gotten its due, and an elegant film noir guided by a uniquely Hustonian on fate and karma that is both softened and accentuated by Negulesco’s more romantic sensibility of crime and punishment. In Huston’s films, the survivors tend to laugh at jokes played by the universe. Here, it’s just a sad smile and a shrug of acceptance. 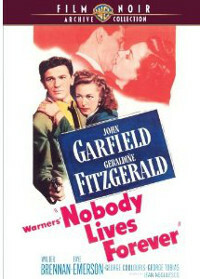 Nobody Lives Forever, based on a novel by W.R. Burnett, stars John Garfield as Nick Blake, a street smart New York hustler back home after his wartime service and a stint (never spoken of again) in U.S. Army Hospital. Just the sight of him leaving the hospital is enough to remind us of the toll taken by the war and sure enough, Nick just wants to rest up when he gets out. But first he has to recover the money he left with his cheating girl (Faye Emerson, perfectly mercenary), a detail that takes a little of his old underworld muscle. He hasn’t lost it, which he proves in spades when he takes over a con involving a rich young widow (Geraldine Fitzgerald again, this time the society naïf). Or maybe he has lost it, at least the predatory instinct, for wouldn’t you know that he falls for his mark. Much to the ire of Doc Ganson (George Coulouris), the rival who set up the scam and wants his payday. Nobody Lives Forever is without a doubt one of the great noir titles, not quite nihilistic but still an expression of nothing to lose. The film doesn’t quite deliver on that promise of existential doom but it does feature Garfield in fine form as the street kid made good on pure self-assurance and native intelligence, and a cast of classic noir types, notably Walter Brennan as Nick’s mentor Pop Gruber, an old con on hard times who pushes Nick to take this job and soon regrets the decision, and George Tobias as Nick’s amiable partner, ready to follow him loyally anywhere. But Coulouris makes the film as Doc, the bitter rival who can’t decide if it’s more important to finish the con or put Nick in his place. Superb as the sweaty, unkempt con-man, a once dapper player now scraping by in threadbare clothes and shabby rooms, and he’s the constant reminder of the opportunism that drives our criminal heroes, no matter how suave or smooth they may appear. Negulesco’s romanticism comes through Garfield’s evolution as Nick. In the dating montage, when Nick takes her to a boxing match, he realizes how uncomfortable she is and immediately escorts her out of the arena. Sure, it’s a cagey move for a con man to show how attentive he is, but Garfield plays it not as a contrived maneuver but rather genuine concern for her discomfort, and Negulesco plays the entire sequence as a real romance rather than a work in progress. I’m also fond of the studio artifice of 1940s film noir, with studio sets and outdoor locations created on the soundstage. The final act is set on a desolate waterfront dock that is clearly a set pumped with fog and lit like a nighttime netherworld. Forget realism, this is a dimension more intense than documentary reality, a place cut-off from the rest of the world where Nick will prove his true colors. In black and white, of course. When you add a couple of other choice titles to this list—The Mask of Dimitrios (1944) and Road House (1948) in particular—you have to acknowledge that Negulesco is a notable noir director. Road House is available on DVD from Fox but the Warner Bros. production The Mask of Dimitrios, Negulesco’s first noir and his first film with Sydney Greenstreet and Peter Lorre, is still missing from home video. This was not a slight, however. According to a spokesman on the Warner Archive Facebook page (where they have a well-deserved reputation for answering questions such as these posted by fans), the studio found the vault materials were not in good enough shape for a release. UPDATE: I found the exact message they gave me: “We were unable to remaster the film to do extreme damage to our existing safety elements. The good news here is that the original nitrate camera negative survives and this film can, and eventually will benefit from new photochemical preservation elements made from the nitrate. After this work is completed, we will then be able to create a new master for the long-anticipated release.” I look forward to that as a follow-up release. All three films look good, with a sharp B&W image and good contrast. The Conspirators, however, shows more wear and speckles throughout and the soundtrack (which has minor crackles) drops its level a little over an hour into the film. You’ll to turn the volume up quite a bit just to hear the voices.